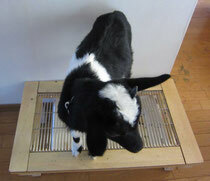 Othello still needed goat's milk, so we asked the farm to send it twice a week. He slept with us at night. We started toilet training him. Of course, nobody sells a toilet for goats. Therefore, my husband designed one and made it by himself. So, it was completely original. We always praised him when he got on the toilet and finished peeing or defecating. Within a week, he learned how to pee on the specially designed toilet.